Considering the road conditions we saw yesterday, we decided to park An Kai’s bus in Mado County on the morning of August 27. Those who could not proceed because of severe altitude sickness stayed in Maduo County as well, while some others with slight indisposition decided to go only as far as Niutou Stele before turning back. Four vehicles (three ATVs rented from local Buddhists and one brought from the plain) carried the remaining 17 of towards Niutou Stele-our destination was the headwaters of the Yellow River: Yueguzonglie. On the way to Niutou Stele, You Lianyuan told us some background information about our destination. According to him, Niutou Stele on the Niutou Mountain was named the source of the Yellow River in the interest of tourism. The Maduo County government set the stele here in 1988 to promote tourism. The words, “The Yellow River Headwater” are carved onto the stele in both Tibetan and Chinese. In the seventh century AD, the marriage processional of Tibet’s King Songzain Gambo and Tang Dynasty Princess Wencheng stopped at Niutou Stele, establishing this place as a symbol of integration between Han and Tibetan cultures. The Yellow River has three main tributaries in its upper reaches, namely the Zhaqu, Yueguliezong and Kariqu from north to south, respectively. Although National Geographic has named Yueguzonglie the main source of the Yellow River, the issue of which tributary is the true source is still a source of controversy among academics. Numerous other rivers and streams join the three main tributaries on the way towards Bayanhe Mountain. At the mountain, all three tributaries converge and form the first stretch of the Yellow River: Maqu. After 16 kilometers of river valley, the Maqu section of the Yellow river enters Xingxiuhai, a plateau in Qinhai where the many small, seasonal lakes look like constellations in the night sky. After its stunning passage across Xingxiuhai, the river continues its way east for another 20 kilometers before entering a large stretch of plains. 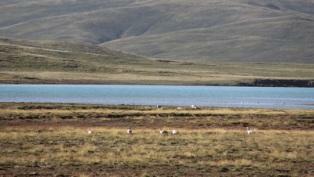 Here, it has given birth to two large lakes, Zhaling Lake and E’ling Lake. These two freshwater lakes are the highest in China. They provide the Qinghai-Tibet Plateau with precious fresh water, and they are called “Sister Lakes in the Yellow River Headwaters.” Crustal subsidence, or a downward shift in the Earth’s surface, played a key role in their formation. Although the Qinghai-Tibet Plateau was formed by orogenic uplift – that is, the plateau is the product of upward displacement of rock on one side of a fault, - the degree of displacement is not equal everywhere. Lakes formed naturally in relatively low areas that had experienced more subsidence. According to You from the bus, the sands at the base of the mountain are traces of an ancient lake, whose waves carried the sand to its current location We can now estimate that the lake covered a much larger area millions of years ago. From a long-term ecological perspective, the lakes will ultimately disappear because materials from the outside world, like silt, continuously flow into them. Therefore, the original aquatic environment will turn into a terrestrial environment. Without human interference, this natural process will take millions of years. However, the process is currently accelerating due to changes in climate and human activities. Numerous lakes of varying sizes have already disappeared. The evolution of the lake. As the vehicles moved ahead, E’ling Lake gradually came into view. The water was so green that it seemed like someone had dyed it. From a distance, we could see some water birds standing in row by the lakeside, manning a naturally advantageous hunting spot. Every spring, when ice and snow melt at headwaters of the Yellow River, many fish swim into the lake with the rising river. When the melting process is over, inflow to the lake stops, and the lake water is evaporates continuously. This lowers the water level dramatically, killing fish whose bodies are then carried to the beach by wind and waves. 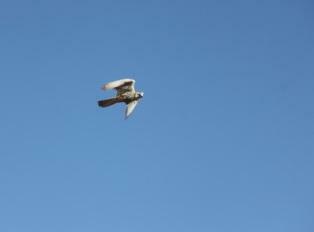 Migratory birds feed effortlessly on such fish. It is indeed a spectacular scene to see thousands of birds gathering here, enjoying the fish. Unfortunately, we did not arrive in early spring, but the beautiful scenery by the lakeside is still easy on the eyes. 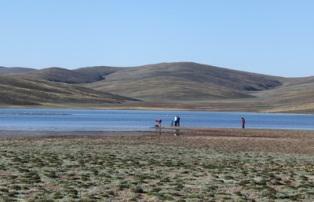 Despite such abundant resources, however, local Tibetans never fish here. Fish are not their food and fishing is not a way for them to earn a living. Last year, we asked a local Buddhist why they do not eat fish. He answered, “All cows and fish are all living animals. We need to save as many lives as possible. If it is not necessary, we would rather not kill them.” Later, in a conversation with some young Tibetans, we noticed that they had inherited this kind of logic. 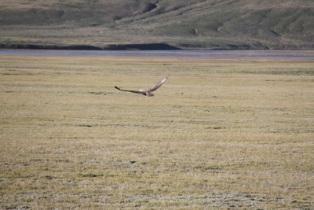 There is a related saying on the plateau: Fish are a god to Tibetans. The colors of the plateau lake are rich and abundant. At the foot of the Niutou Stele, we saw a large stone carved with the Chinese characters “Ying Qin Tan” [‘beach wedding,’ or ‘welcoming immediate family on the shore’], and couldn’t help imagining how grand the greeting procession once was, with rows of Tibetan tents, thousands of carts and flags, as well as splendid musical performances. How did Songzain Gambo feel when he stood here thousands of years ago, looking at the scenery far away, thinking of the Chinese princess coming from the distant Central Plain, and guessing about the intentions of the Tang Emperor? Was he both excited and worried just as we are now? We – like Songzain Gambo – are excited to wander around in the beautiful scenery. We are worried about the deterioration of grasslands and lakes; what was on Songzain Gambo’s mind? There is a temple on the grassland by the lake. Outside the temple stand winding stonewalls the height of an adult. Some lofty Buddhist sutra streamers wave in the sky, as if they are silently reciting scriptures. Yet it is said that some temples here have already been changed into hotels-how many acres of lands on the Qinghai-Tibet Plateau are still uninfected by commercialization? Although the road was very bumpy, our vehicles finally made it to Niutou Stele. The stele was decked out with Hada and Buddhist sutra streamers. According to our Buddhist driver, these represent a prayer to the headwaters of the Yellow River. On top of the mountain, we could see E’ling Lake to the left and Zhaling Lake to the right. A river flows into Zhalong Lake from the southwest and flows out at the southeast corner. The mainstream of the Yellow River is just to the south of the center of the lake. This brings in large amounts of sediment, making the lake appear pale during storms and giving it the name “White Lake”. 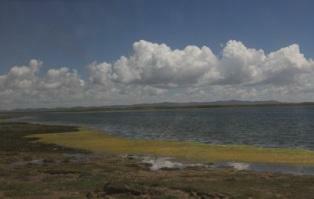 The sediment gradually sinks, so the water is green by the time it reaches E’Ling Lake. Three small islands are located in the western part of Zhaling Lake, near the point where the Yellow River enters the lake. 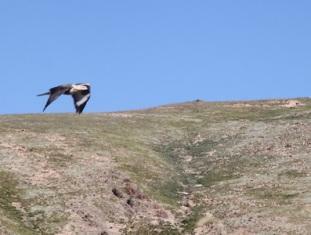 Migrant birds flock to these islands in the summer. 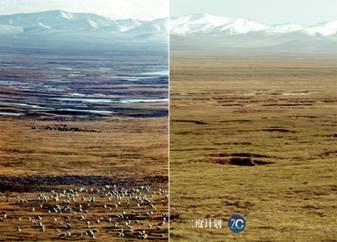 Some experts say that the upper reaches, as well as the lower reaches, of the Yellow River are drying up. Over the past few years, over-grazing, excessive digging for gold, climate change, and other factors have caused grassland degradation, brought about a severe rodent problem, and made the area vulnerable to soil erosion. Since 1997, the increased sediment load in the Yellow River has caused intermittent drying spells. From October 10, 1998 to July 3, 1998 the stretch of the Yellow River between Zhaling and E’ling lakes ran dry for six months. 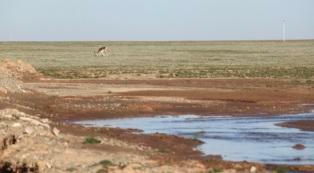 The drying of the Yellow River has deleterious ecological effects, including grassland degradation, an increase in the rodent population, a decrease in the wild animal population, and a drop in the livestock production. This is only part of the story: the drying up of the Upper Yellow River could destroy the ecological safety of the entire river. We are looking forward to finding out whether the “Chinese Water Tower Plan” will help protect the eco-systems of Jiangyuan district. 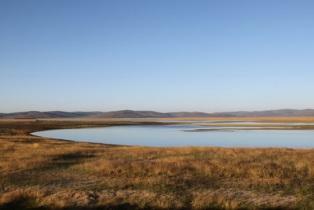 After leaving Niutou Stele, we drove along Zhaling Lake for a long time. Last time when we got here, Geologist Yangyong expressed his concerns several times that the shrinking of Zhaling Lake was worse than that of E’ling Lake. Today we took the pictures of the receding water line. We don’t know how to describe this kind of beauty. While looking for Xingxiu Sea and getting nearer to the source region of the Yellow River, two Frenchmen leading horses invited us to get off the bus. 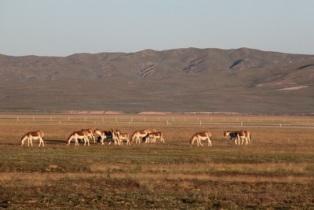 They had rented four horses and been walking for three weeks towards the source area of the Yellow River. Unable to speak Chinese, they depended on their map and the road along the mountains to guide them to the headwaters. When we asked whether they were afraid, they replied “what is there to fear?” We did not ask them any further questions. As we watched the two trekkers continue on their way, we began a heated discussion on the bus. A few of us found it very romantic, and hoped one day they would live in the same way. Several among our group admired the two trekkers, but when asked whether they would embrace this kind of challenge, they remained silent. We couldn’t help thinking what it meant for modern people to be so close to nature. We continued on our way to look for Xingxiu Sea. 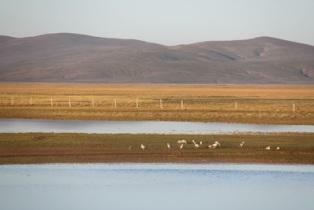 As we travelled, the colours of Zhaling Lake and Nuling Lake kept changing in the shifting lights. 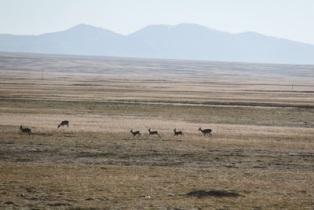 Tibetan antelopes and Equus Kiang kept passing us. 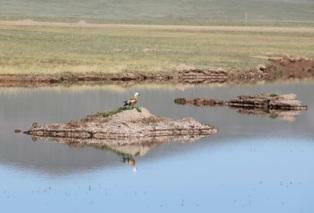 What was more surprising was that we found the throne of King Gesar on our way. We got off the bus and took pictures while our local bus driver knelt down to show his respect. Local people told us that in months with abundant rainfall, Xingxiu Sea temporarily recovers its original appearance. Geologist Yang Yong sent us pictures of Xingxiu Lake from a July recovery period, but the rainy season was over, and the lake was dry when we visited. Will climate change or man’s influence be the dominant force behind the drying of the lakes and rivers, grassland degradation, and the deterioration of the environment? It is hard to judge as there are too many complicated relationships to consider, but water resources expert Wang Jian said that both climate change and man contribute to these problems. The damage caused collectively by the two causes will effect irreversible environmental damage. Therefore, regardless of which factor has led to the destruction so far, humans cannot escape their responsibilities and obligations to protect the environment. 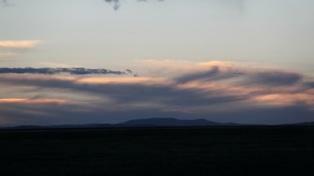 The sunset was so beautiful that we stopped and took pictures for a long time. After dark, a jeep stopped by the side of the road and asked us whether we were going to Maduo Town. We had intended to meet with Nima, the president of Suojia Town, Zhiduo County, Yushu and follow him to the first elementary school of the source region of the Yellow River. Last year when we were conducting interviews there, we donated a green reading room and a mini-water engine for that school. 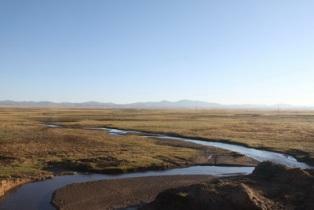 But as it was dark by the time we arrived at Maduo Town today, we couldn’t make it to the source of the Yellow River. Later, we learned that it was not the Nima town secretary, but rather a high-ranking party official who had welcomed us. He told us that we were all guests for voluntarily coming to such s remote area at night. After a warm greetings, he offered us hot noodles. 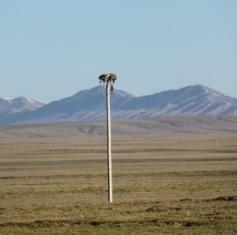 In the cold wildness of the source region of the Yellow River, local people have impressed us with their warmth. Tomorrow, we are going to our final destination, Yueguzhonglie, to pay a respectful visit to one of the sources of the Yellow River. We’d also like to see whether one of the biggest sources of river water is suffering from drought. What is the surrounding environment like?